House II: The Second Story (also released as La Casa Di Helen or informally as La Casa 6) is a 1987 American comedy horror film. While it is a sequel to the 1986 film House, House II does not involve the storyline and characters from the first film, and is a new supernatural comedy, with a tone even lighter than the original film's. 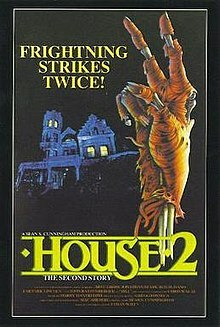 House II: The Second Story was released on August 28, 1987, grossing $10 million worldwide against a $3 million budget and received negative reviews from critics. Young urban professionals Jesse (Arye Gross) and his girlfriend Kate (Lar Park Lincoln) move into an old mansion that has been in Jesse's family for generations. They are soon joined by Jesse's goofy friend Charlie (Jonathan Stark), who brought along his diva girlfriend Lana (Amy Yasbeck), in the hopes of being discovered by Kate, who works for a record company. Jesse has returned to the old family mansion after his parents were murdered when he was a baby. While going through old things in the basement, Jesse finds a picture of his great-great grandfather (and namesake) in front of an Aztec temple holding a crystal skull with jewels in the eyes. In the background is a man Jesse learns is Slim Reeser, a former partner of his great-great grandfather turned bitter enemy after a disagreement over who would get to keep the skull. Reasoning that the skull must be buried with him, Jesse and Charlie decide to dig up Jesse's great-great-grandfather in the hopes of procuring the skull. They unearth the casket only to be attacked by the corpse (Royal Dano), who then shows himself to be friendly when Jesse reveals his identity as the senior Jesse's great-great grandson. Jesse and Charlie take the cowboy zombie, nicknamed "Gramps", back to the house, where he is horrified to learn that the skull has not rejuvenated his body as he had hoped. Gramps and Charlie go out drinking and driving, and later the boys listen for hours to Gramps' stories of the old west and his outlaw life. Gramps explains that the house was built using stones from the Aztec temple, and that its rooms act as a hidden doorway across space and time, with the skull acting as a key. He charges Charlie and Jesse with defending the skull against the forces of evil, who are drawn to possess the skull. During an impromptu Halloween party thrown by Charlie, Gramps makes an appearance (though he is overlooked as it is a costume party), Kate leaves Jesse (taking Lana with her) after he is seen with an old girlfriend by her smarmy boss (Bill Maher), and Jesse and Charlie pick up two new pets in the Jurassic era, a baby pterodactyl and a caterpillar-dog, after a barbarian/cave-man arrives at the party and steals the skull. Bill (John Ratzenberger), an electrician and "part-time adventurer", arrives to inspect the house's old wiring. While seemingly a buffoon, he pulls a short-sword from his tool case and leads the boys through "one of those time-portal things...you see these all the time in these old houses." In the mystic past, the three rescue a Mexican virgin who was about to be sacrificed, who seems to like Jesse but throws things at Charlie. Eventually, a zombified Slim Reeser makes his appearance. Still after the skull, Slim shoots Gramps, who then gives Jesse his guns and reveals that it was Slim who shot and killed Jesse's parents when he was a baby. Jesse jumps through a window into the Old West, and eventually succeeds in killing Slim by blasting off his head with a rifle. Gramps, who has been mortally wounded, begins to pass away. Gramps says goodbye to Jesse and tells hims he is so happy to have met his great-great-grandson. Gramps then gives a final warning about the power of the skull, encouraging Jesse to get what he wants from the enchanted object and then get rid of it. As Gramps passes, Jesse embraces him in a hug. The film ends with the revelation that Jesse used the skull to travel back into the Old West, where he, Charlie and the rest of their friends drive off in a wagon, leaving the crystal skull behind, marking Gramps' new grave. Kane Hodder was the stunt coordinator on the film. House II: The Second Story received negative reviews from critics. It has a 10% "rotten" rating on movie review aggregator website Rotten Tomatoes, based on ten reviews. In October 1987, Marvel Comics released a comic book adaptation of House II. It was written by Ralph Macchio, with artwork by Alan Kupperberg on pencils and Kupperberg, Hilary Barta, Danny Bulanadi, Jose Marzan Jr. and Pat Redding on inks. Its cover price was $2. ^ "House II: The Second Story (1987) - Box office / business". Internet Movie Database. Retrieved 4 August 2012. ^ J.C. Maçek III (2013-04-26). "Books of the Dead: The Followers and Clones of 'The Evil Dead'". PopMatters. ^ "House II: The Second Story - Rotten Tomatoes". Rotten Tomatoes. Retrieved 4 August 2012. ^ "Comic Book DB - The Comic Book Database". comicbookdb.com. Retrieved 4 August 2012. This page was last edited on 5 April 2019, at 16:27 (UTC).